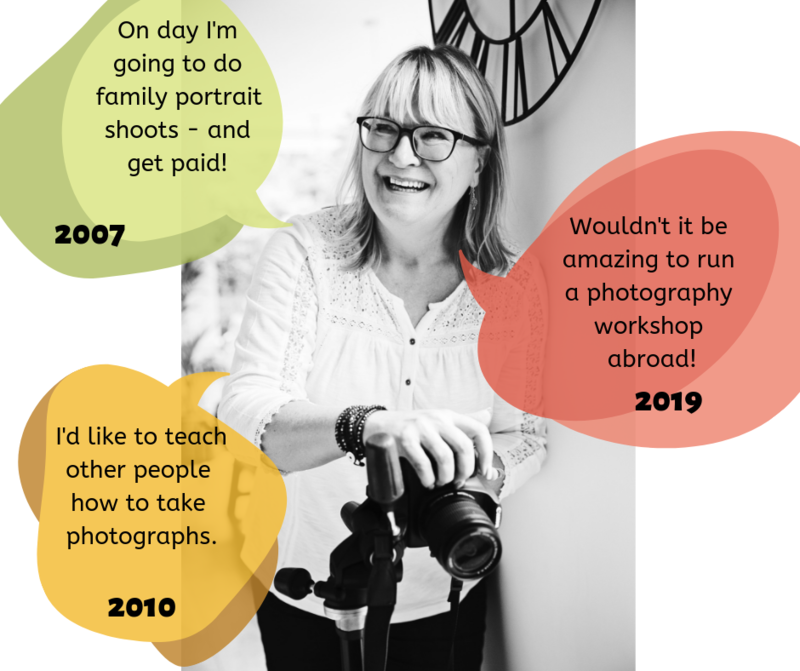 It’s National Make Your Dreams Come True day today so I thought it might be useful to get you thinking about your photography goals or dreams. We’re already almost halfway through January and, if you’re anything like me, you’ve probably already ditched a few of your New Year’s Resolutions. I don’t tend to make any that involve me giving up anything I enjoy, as January would be quite a long, bleak month without gin or chocolate! It is a good time, however, to curl up somewhere warm and cosy on a wet, damp Sunday afternoon and think about what you’d really like to do with your photography this year. Someone in my Facebook photography group Love Your Lens actually asked this question a few days ago and it was interesting to see the answers. Some were very specific about mastering new skills, whilst others were more general: get out more with my camera, print more of my images etc. At this stage my advice would be to not be afraid to dream big... you may not make them all come true but you can make a great start. And don’t fall into the trap of thinking you can’t make it happen. A skill like photography is a very personal and subjective one and it’s all too easy to convince yourself you’re not good enough and to look at other people’s images on Instagram and feel humble and unworthy. If I had listened to the negative voices in my head I would not be a professional photographer today. Back in 2007 I was made redundant and really didn’t want to pursue my career in marketing. I absolutely loved taking photographs, mainly of my kids and flowers and it was flattering to hear people say I should go professional. I can’t tell you how terrified I was the first day I walked into a nursery to photograph the children. And how I laughed my head off when a friend suggested I do private shoots in people’s homes. Then I found myself photographing a Christmas brochure for a swanky hotel (because I’d photographed the owner’s kids at nursery). Each new job scared the pants off me, but also gave me experience and gradually my confidence grew. Can you imagine how terrifying it is to photograph your first wedding? So I didn’t charge anything and I actually did a great job and should have earned at least £500. So next time I charged £750 and a few years later found myself in Italy photographing a wedding for several thousand pounds. And so it goes on. If you’d like to read a little more about the lessons I learned along the way take a look at 7 things that have made me a better photographer. Whatever your dreams are for 2019 write them down somewhere and think about what needs to happen to make them come true. I know one lady who’d love to become a travel blogger and has enrolled herself on a writing workshop. She’s coming along to the Mindful Photography Retreat in France in May this year (back in 2007 I never would have dreamt of running something like this) and I’m going to encourage her to take some great photos and write her first blog post. Another wants to do her first professional pet shoot (she’s more than ready but doesn’t believe it!) and I know a couple of people who want to photograph weddings for friends and family and will do a super job. Please share your photography goals in the Love Your Lens Facebook group and ask for help or encouragement. I’ve always had a mentor to bounce ideas off and make me accountable and I find that really helps. So go, get those dreams written down now and you’ve take the first step to making them come true.